Wild Night -- As Brian Rolston correctly pointed out after Monday's 3-1 win against the Colorado Avalanche, every game the Minnesota Wild play the rest of the way will feel like a postseason contest. And as we all know, goaltending is the biggest factor in the Stanley Cup Playoffs. That's why the Minnesota Wild should feel encouraged following Niklas Backstrom's 29-save performance against the Avs -- a performance that gave the Wild a two-point lead in the Northwest Division. The victory was also key when you consider the fact that Minnesota begins a crucial four-game road trip Wednesday night at San Jose. The Wild will also visit Vancouver, Calgary and Edmonton. "We know that we're leaving tomorrow for four games on the road," Backstrom said after Monday's victory. "We needed this win. We needed the two points. It's good for us. We got it in regulation. It's good to move on and get ready for Wednesday. It's good for our confidence to show we can play against these clubs. We know how we should play against them." Colorado, meanwhile, is still very much alive in the division race despite the loss. The Avalanche return home to host the Flames on Thursday night in yet another "playoff" game. Let the best part of the year begin. "It's exactly like a playoff game," Rolston said. "The good thing about all of us being around the 84(-point) mark is we'll all be playoff ready. These last nine games will be a playoff game every night because we're all fighting, scratching and clawing to get into the playoffs." 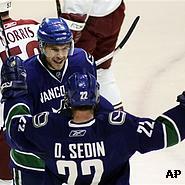 The Canucks' Taylor Pyatt is congratulated by Daniel Sedin after scoring against the Phoenix Coyotes last night. Twin Peaks -- Henrik and Daniel Sedin have been separated as of late by Vancouver Canucks coach Alain Vigneault, but the twins found enough time to play a role in a pair of goals in Monday night's 3-1 win over the Phoenix Coyotes at GM Place. Henrik scored twice for his first non-empty net goals in 17 games, while Daniel had two assists for his first points of any kind in the last six contests. Their play helped the Canucks pull into a three-way tie for second place with Calgary and Colorado in the Northwest Division. "It's great to see Hank score, he was right in front of the net on both goals and he stood up and played a good game tonight," Daniel Sedin said. "I think you have to shoot the puck and look for rebounds and then you can make plays. Maybe we got way from that when we were in this slump." It's the perfect time for the Sedins to snap out of it, considering the Canucks will play four of their next five games on the road. They will visit the Edmonton Oilers Thursday night. "We're trying to catch the teams in front of us," Henrik Sedin said, as Vancouver is just two points behind Minnesota for the division lead. "We have a really tough stretch here with a lot of games on the road. It was a huge win for us." Here Comes Okposo -- While the New York Islanders are all but out of the Eastern Conference playoff race, the franchise is still doing its best to keep its fans excited. Kyle Okposo, the team's first-round draft pick in 2006, with make his NHL debut Tuesday night when the Isles host the Toronto Maple Leafs at Nassau Coliseum. The 19-year-old has eight goals and 16 assists in 29 games with the Bridgeport Sound Tigers in the American Hockey League. Listed at six feet and 195 pounds, Okposo will skate on a line Tuesday with Richard Park and Blake Comeau. "I think I fit in pretty well out there, playing with Richard Park and Blake Comeau," Okposo said after Monday's practice. "Parkie's pretty responsible defensively, so that's going to help me out there. I feel like I'm ready." The Islanders are certainly ready for Okposo. Entering Tuesday's action, New York is tied with the St. Louis Blues for the fewest number of goals scored in the NHL (176), a paltry average of 2.4 per game. "I just look at is as a challenge and kind of try to ignore all the hype," Okposo said. "I'm just going to go out there and try to play my game and do the best I can to help the New York Islanders win." That would be a nice change of pace, as the Isles have lost six straight games to basically fall out of playoff contention. If anything, though, these remaining nine games in the regular season will help coach Ted Nolan and GM Garth Snow gauge Okposo's development heading into the 2008-09 campaign. "This is not the American Hockey League or college hockey," Nolan said. "Things happen a little bit quicker. It's the best League in the world. We're trying to put him with one of the most reliable guys that we have in Richard Park. He's probably going to make a few mistakes out there, but when you have Richard out there to compensate for that, that's a big thing. Blake Comeau has some good speed and good hockey sense. The three of those guys together should form a pretty good line."